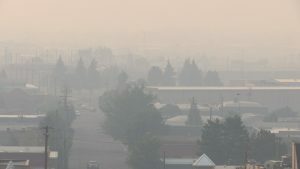 GRANTS PASS, Ore. – Wildfire smoke had a major effect on the Rogue Valley’s economy this year. Now, Rogue Community College’s Small Business Development Center is promoting a smoke impact survey to better assess the financial damage. Numerous businesses say they lost money due to the smoke this past summer. The Oregon Shakespeare Festival was forced to cancel performances and layoff personnel. Even the region’s grape harvest was affected. RCCBC said by completing a short survey, you can help the Grants Pass and Josephine County Chamber of Commerce compile information with the hopes of better understating the impacts of smoke this past season.